This house in the Norfolk Broads by Platform 5 Architects features steeply pitched gables and shingle cladding intended to reference traditional boat sheds found alongside the surrounding waterways. Backwater was designed as a family residence for Platform 5 Architects' director Patrick Michell and was built on a plot previously occupied by an outdated bungalow. 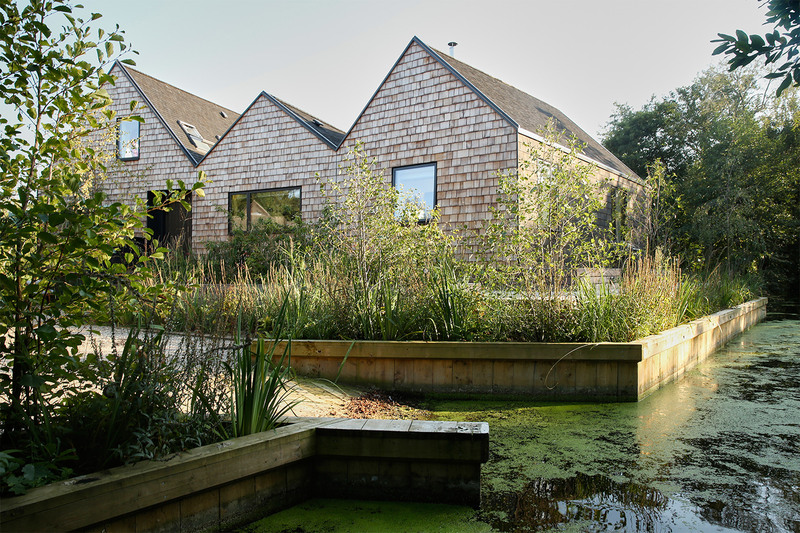 The London-based studio wanted to create a home that respects and makes the most of its unique wetland context. "Designing a new building for the plot provided the opportunity to enhance the setting by establishing a stylish counterpoint to more traditionally designed neighbouring houses, while respecting the peaceful location," the architects explained. "A key objective was to create simple, contemporary living spaces at the centre of the house that are orientated to benefit from the views of the surroundings." The building comprises three bays containing the main living areas, which are cranked to achieve varying views of the adjacent woodland, lagoon, reed beds and jetty. The building's tall pitched roofs are clad in blackened-timber shingles that extend onto the end walls, creating the sense of a seamless surface enveloping the building. The gabled front and rear elevations are covered with untreated shingles that will weather over time to take on a textured appearance echoing the surrounding trees.